Legendary singer, Bright Chimezie, is one musician that some of the younger generations might not know as he was one o many who rulled the Nigerian music scene in the early 70 to the late 90s. His music style became known as Zigima Sound. It is a genre which became popular in the Eastern part of Nigeria in the early 1980s. It is a mix of traditional Nigerian music and Igbo highlife fused with chanted vocals. Bright Chimezie used it to revolutionize the musical structure in Nigeria with lyrics that focused on social issues of the country in a rather funny way. One of the things that gives him joy is the fact that he wakes up everyday to see his ever happy mother still looking healthy and happy at 93. 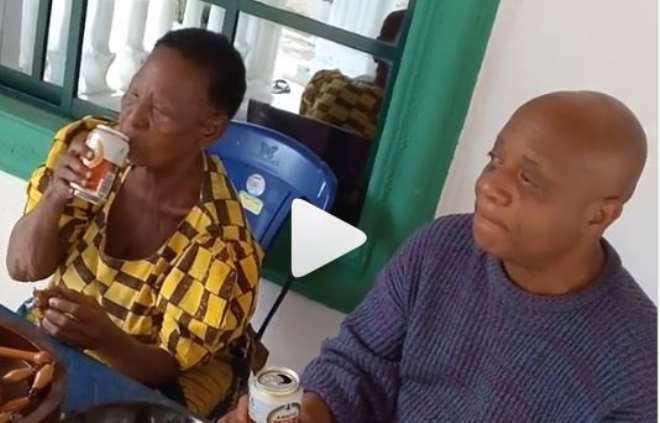 Being the son he will always be, Bright and his 93-year-old mother were seeing having a cute mother and son time ‘She said he shouldn’t look at her meat." Bright state that even at 93, his mother has not lost her sence of humour.